Have a seat hummus. The Goddess is in town. My husband is always asking me if we have snacks in the house. This usually occurs around 9pm when we’re both in our PJ’s and relaxing on the couch. I never keep snacks in the house; that’s by design. If I keep little treats or anything that’s packaged and easily edible in the house, I will eat it! And not over the course of a week… that day. It’s so bad, that my husband will have to hide his snacks in the car just so I don’t eat them. Clearly I have no self control. This dish was born out of the desire to have a snack that I could keep in the house and not feel bad if I ate the entire thing. My first thought was hummus. A healthy snack, but I wanted brighter flavors and I wanted to bump up the health benefits. 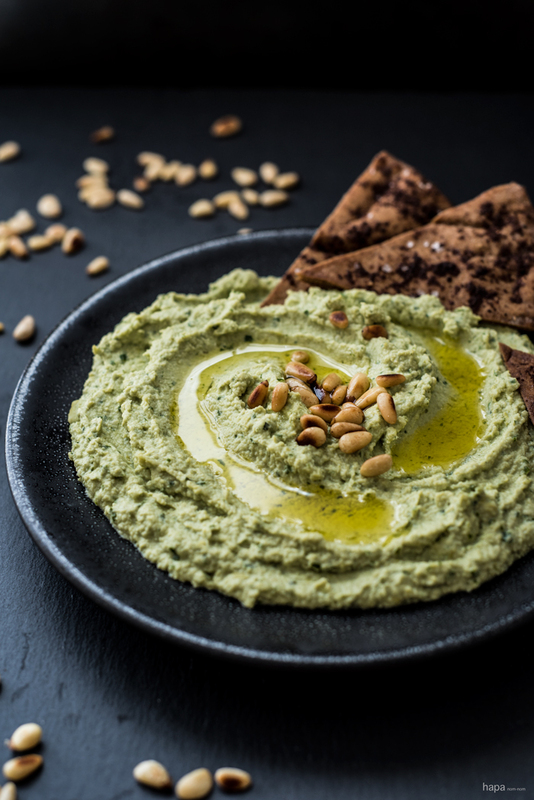 This is what’s so super about this Super Green Goddess Hummus – I replaced the chickpeas with edamame to add more protein… and add to the vibrant green color. Then I put a Green Goddess spin on things to add plenty of fresh herbs and flavor, then I threw an avocado in there to add more nutrients and a creamy texture. The result was amazing! It was luscious, flavorful, and a spectacular shade of green – I felt healthier just looking at it! And what’s even better – it’s filling! So snack away my friends, snack away. Add the water and the edamame to a small saucepan and place over high heat. Bring to a boil and cook uncovered for about 1 minute. As soon as all the edamame is thawed, turn off the heat. Pour the edamame and the water from the pan into a food processor. Add the avocado, garlic, parsley, tarragon, chives, lemon juice, tahini, and 1 teaspoon of salt. Process until smooth, about 2 minutes. If needed, add a little water to thin out the mixture - 1 tablespoon at a time until you reach the desired consistency. Allow the mixture to cool to room temperature before serving. Cut each pita bread in quarters and each quarter in half to make 8 triangles. Place them in a single layer on a sheet pan and brush lightly with olive oil, sprinkle with sumac, and sea salt. Bake for 10 - 12 minutes. In a dry saute pan over medium-high, toast the pine nuts by moving the pan around constantly - this should only take about a minute. When ready to serve, spoon the hummus out onto a serving dish. Using the back of a spoon, spread the hummus around to form several circular canals. Pour the olive oil into the canals and top with the toasted pine nuts. Serve with the pita chips and enjoy! hello….doing it but don,t have fresh tarragon,what is the best substitution?? Hello there! If you can find chervil, that would be the best substitution. If not, you can either omit the tarragon or you could try using basil. The basil will give you a different flavor, but I think it would work nicely in this dish. Happy eating! I am so trying this. We’re having a BDay party for my brother in law and this would be great. I just don’t know how easily I can find edamame here. I love the tarragon idea and have that growing. This little island doesn’t have edamame right now, but I do have peas. I also have snow peas, so I thought they might work well if I shell them? Hi, Lucy! Thanks so much for your comment and I’m thrilled to hear that you enjoy the recipes! I really try to make them as easy to follow as possible, so thank you so much for saying so 🙂 I hope your New Year is off to a great start! I didn’t have tarragon and I substituted the chives with shallots…and still, OMG. Healthy? Did;t even cross my mind. This was inhaled between 2 with lebanese bread and I didn’t even bother making dinner, didn’t need it! I was crazy full! SO GOOD!!! Totally genius to use edamame in a hummus! And tarragon was totally innovative too! And your pics are beautiful! Thanks, so much Rachelle. I hope you have a wonderful weekend! Maybe if I look at it long enough I won’t have to go to the gym today? And if I make it – cancel my membership?! Oh man, Kathleen – this is a stunner! On so many levels! Loving everything about this, my friend. And I’m with you – keep the shiny bags away! I am soooo like you, Kathleen, with the snacks. Unfortunately we do keep some in sometimes and yes, I do eat them!! But I LOVE hummus and think this version of yours is one of the best I’ve ever seen. I’m actually kicking myself that I didn’t think of making a hummus with edamame myself! Great reminder to make hummus to snack on more often … and now I’m inspired to make some homemade pitta chips, too! I love this green take on humus! Looks incredible! I love love love this dish! At first I thought it’s just another guac but then I found out this is SO cool! Frozen edamame is our favorite snack and we always have it in freezer. We do keep some snacks at home – giant bag of tortillas chips and salsa. Now I can’t wait to try out this wonderful dipping in the kitchen! Yeah… if we had a giant bag of tortillas chips and salsa, it would be GONE in a day! Holy damn girl … you just made me drool all over my computer screen! These pictures are so beautiful and the hummus sounds amazing. Nice work! My husband and kids are always hungry. It feels like I’m always in the kitchen fixing up snacks for them too haha 🙂 This hummus gorgeous, Kathleen! Love the edamame and tarragon in here! It’s the perfect healthy snack! I used to be so good at avoiding junk food in the house, but it’s been really hard the last couple of years. If it’s there, I will seek out, especially if it is salty and crunchy. This hummus sounds fantastic and exactly what I need to have in the house for snack attacks too! Yum, this hummus sounds delicious! I love the super green goddess flavor in this hummus! Definitely perfect for snacking, since I usually try to avoid pre packed snacks in the house, just like you! Pinned to try it! Oh damn Kathleen!!! I am SOOOO in love! Ever since I went vegan I have been eating hummus by the boatloads!!! This is fabulous!! And My husband asks me what snacks do we have between 10-11 pm when I just finished washing the dishes and the kitchen and am ready to chill out for an hour on the couch,,.Why don’t they come up with their own snacks 🙂 Have a great weekend doll! Oh really?! Well then I’m glad I didn’t post just a plain ol’ chickpea hummus 😉 I hope you and your hubby enjoy! Kathleen, no snacks in the house?! I love that. . but then my kids and snack loving husband would die (and kill me) 😛 I got into the no snacking while doing the whole 30. . there’s something really effective about not snacking but then again, I like to graze and nibble here and there so I don’t eat a ton at meal times. 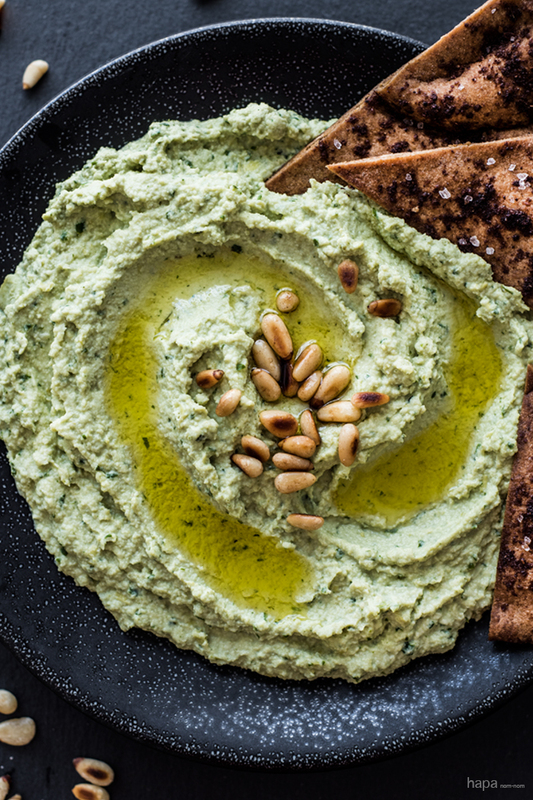 Bring on the green goddess hummus! this looks so good!!! I just…I keep saying it. I feel like a groupie. You just take food cool to another level. I don’t know what it is, I just know that I think everything you share is cool. I’ve seen green hummus before but had no interest in it. I read your words about it (fellow snack queen!) and I WANT to make this. PS At least you have a hubby to HIDE snacks from you. I try hiding it from myself. Doesn’t work!!! Ha! I’m just picturing hiding my OWN snacks! Given my short-term memory, I’d probably forget where I hid things anyway. I like to call that, ‘foodie e.s.p.’ 🙂 I’m so glad I could help with your edamame needs – I hope you enjoy, Nicole! Had all ingredients (except for pine nuts) in the house and made it last night for dinner – LOVED it! HAHA! That is so funny that your husband hides his snacks in the car! I am totally guilty of eating too many snacks. My husband loves hummus. 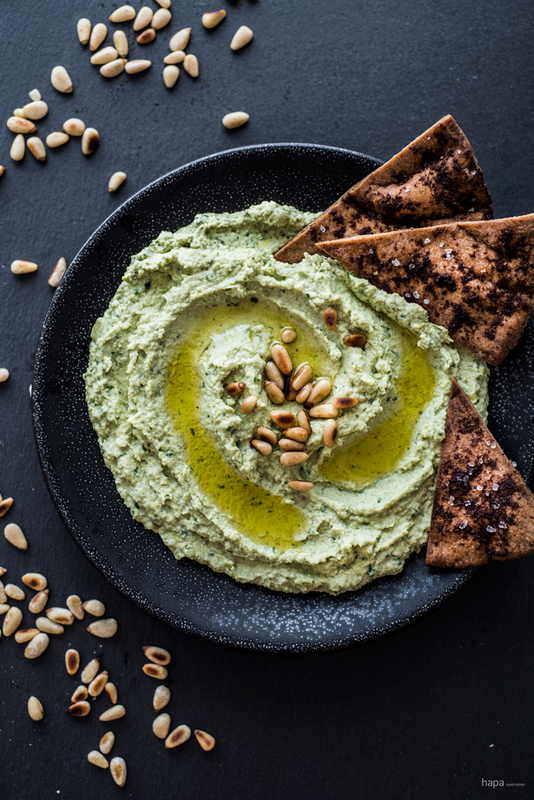 This green hummus would be the perfect snack for him! I am all too familiar with the foraging husband 🙂 This is a great snack to have around and I eat edamame everyday for my snack so I have to try this. Pics are outstanding.